See! I told you Holly was pretty! She is a sweetheart, too, they both are. After breakfast and again after dinner yesterday the three boys (plus Holly in the PM) chased and humped and had big drinks of water for almost an hour. Quite a commotion! I watched in all from the couch because, unfortunately, I broke my left foot on Wednesday morning. I was running on the canal when I stumbled and landed on the side of my foot. Interestingly, I did the very same thing exactly thirty years ago. You’d think I’d learn. No cast, but it is elevated for the short term and they gave me one of those boots so I’ll be able to walk. I finished a wonderful mother/daughter novel called Amy and Isabelle, by Elizabeth Strout, and am now reading her recent book, Olive Kitteridge. Oh, and while I’m making recommendations: pistachio encrusted chicken breasts. Food process the pistachios: it’s fantastic. This shows their personalities perfectly. Oscar, long and lanky, seriously intent on the food in my hand. He is obsessed with The Ball and we have to hide it from him after he works himself up in a frenzy. He sits with his hind legs straight out (which you can kind of see in this picture) and if he is on a smooth surface he just slips down on his face. I’ve never seen a dog sit like that, I call him Super Freak. Spencer, shorter and built like a tank being is just an affectionate goof ball. Happy to be with us no matter where. Just follows me from room to room and lays under my desk in my home office while I work. He is obsessed with paper and will eat paper towels all day long if I let him. We’ve had to move all the paper waste baskets on top of the desks. I call him The Velcro Dog. Buddy is stretching his wings. 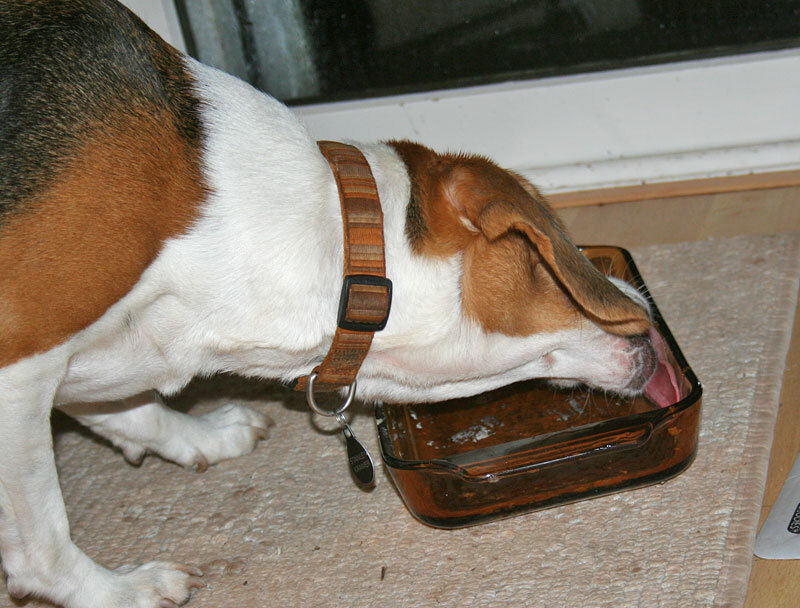 He jumped onto the kitchen table (no food there — and don’t worry, Audrey, we laughed! 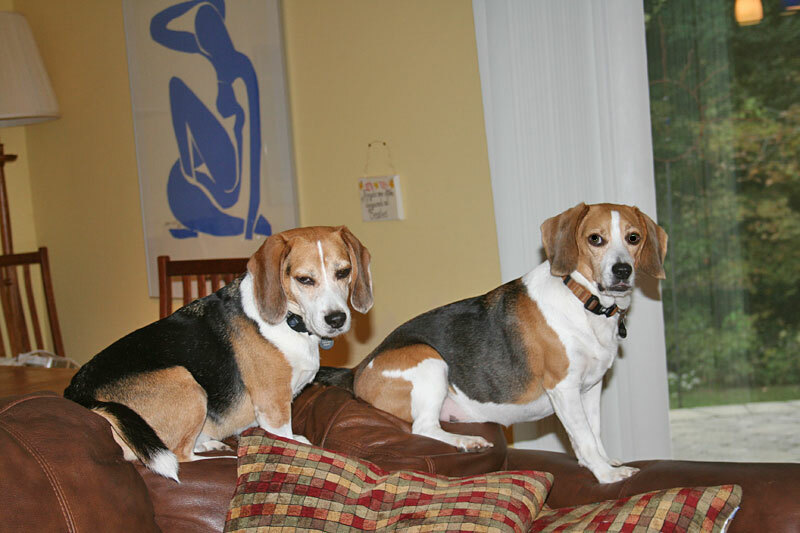 ), climbed atop the wood pile, and started to hump Sherman. The last made us reconsider allowing him in the bed, so Buddy will sleep in the pup tent for now. Stanley, who is below Sherman in the hierarchy, is above Buddy, but as I said, Buddy is trying to be above Sherm. Take that and meditate on it for a while. Holly is a true beagle chow hound. She rivals Stan in that department. She also likes to stand outside the kitchen door and request “in” despite the fact that she has not one but two doggy doors at her disposal. It’s hard to say no to such a pretty face. I will try to get more pictures of Miss Holly. These are my three girls. 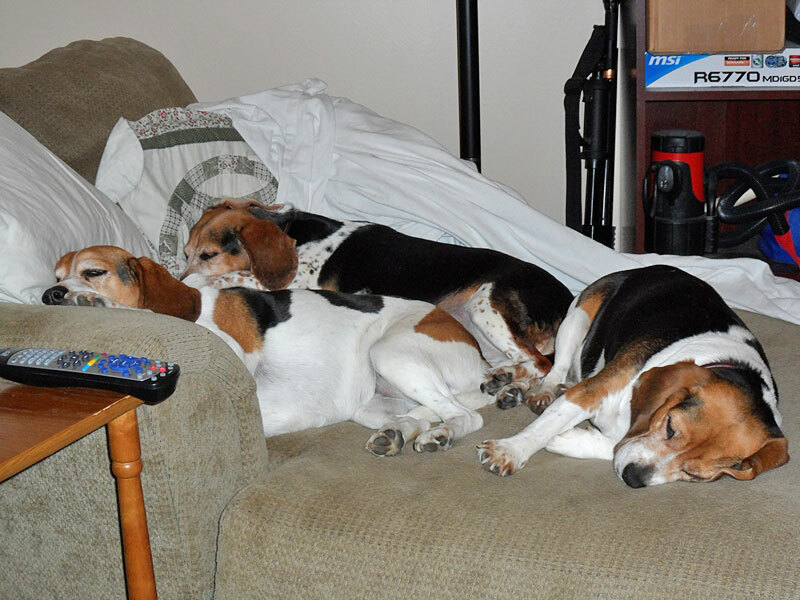 The one with her nose on the arm of the chair is “The Queen” Mable she is 8 years, “The Speckled Pup” is Daisy Mae she is around 8 or 9 years old, and the one on the end is “Trouble” her name is Sadie and she is 3 to 4 years old. We rescued all three girls. 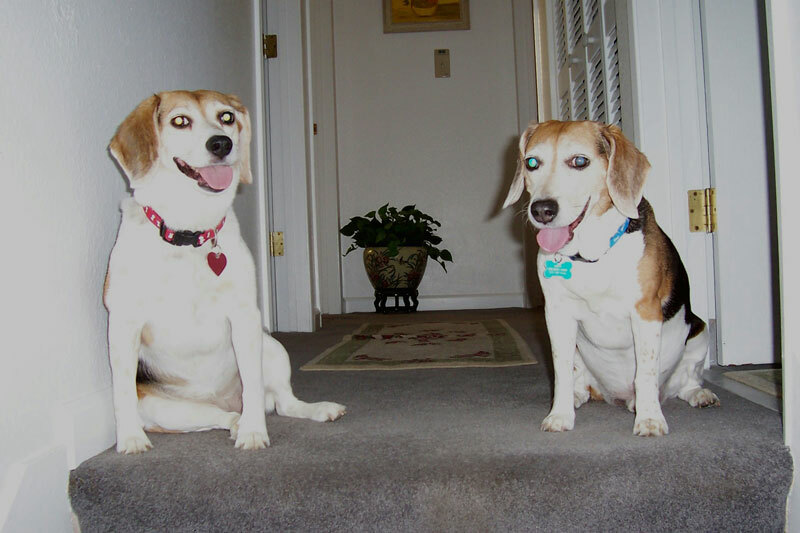 Mable was rescued from SOS Beagle Rescue, Daisy Mae was thrown out of a car near my friends horse farm and Sadie was eating road kill on the side of the road when my husband and daughter found her. 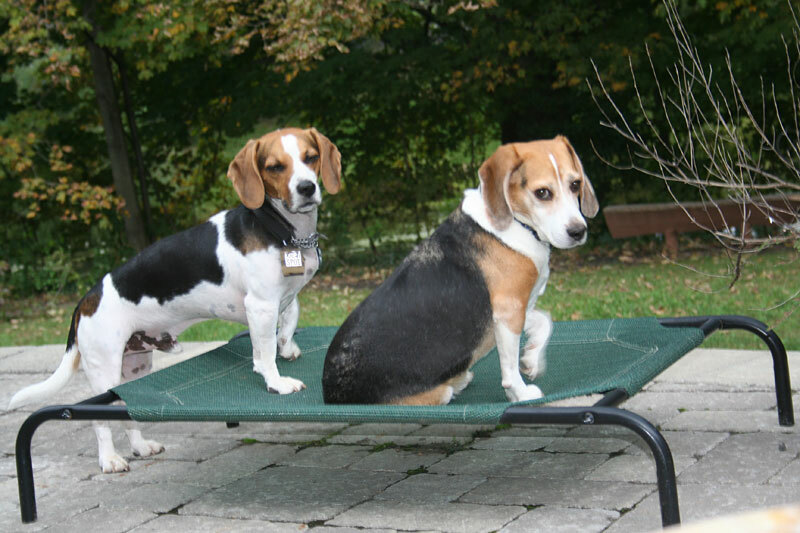 Did we rescue them or did they rescue us? Say hello to Mocha and Hershey. Hershey (see inset) the big guy is a Labrador mix we welcomed 6 years ago. 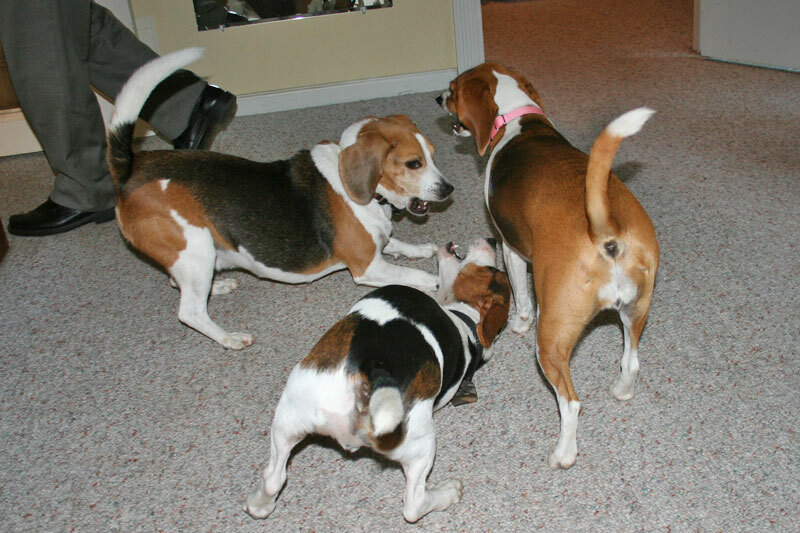 In April we welcomed a beagle mix back to the pack. 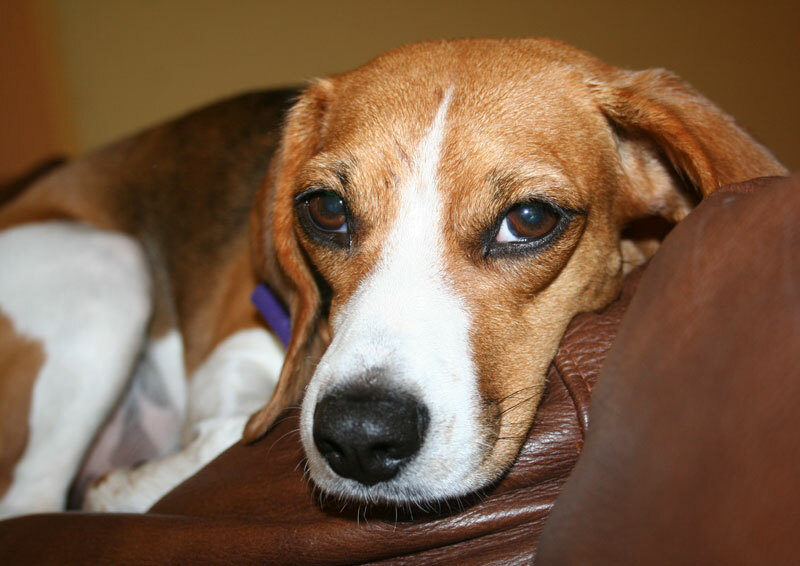 Mocha has a very special story, her mom was killed when she and her siblings were one day old. A good Samaritan found them and cared for them. Sadly all the puppies but Mocha died. 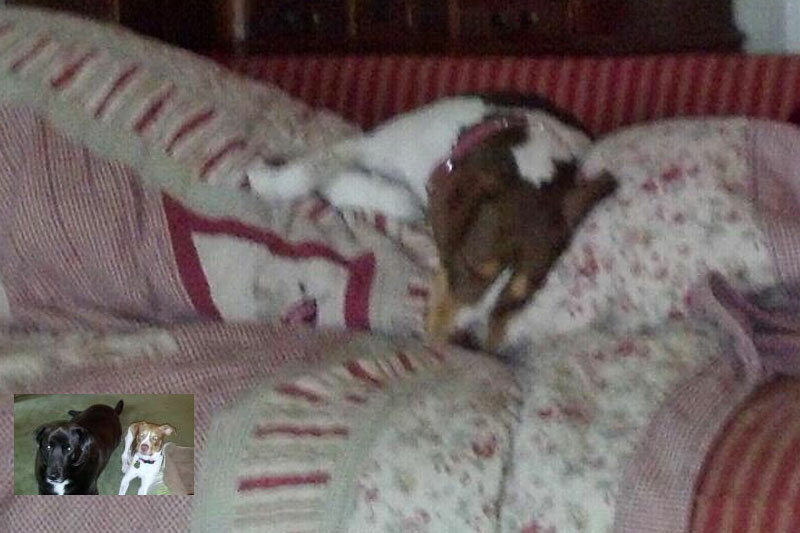 The first 6 months of her life she spent in and out of kennels and vet offices never spending time in a “home”. At first she was afraid of everything including the back yard but as you can see from the pictures she is getting the hang of it. 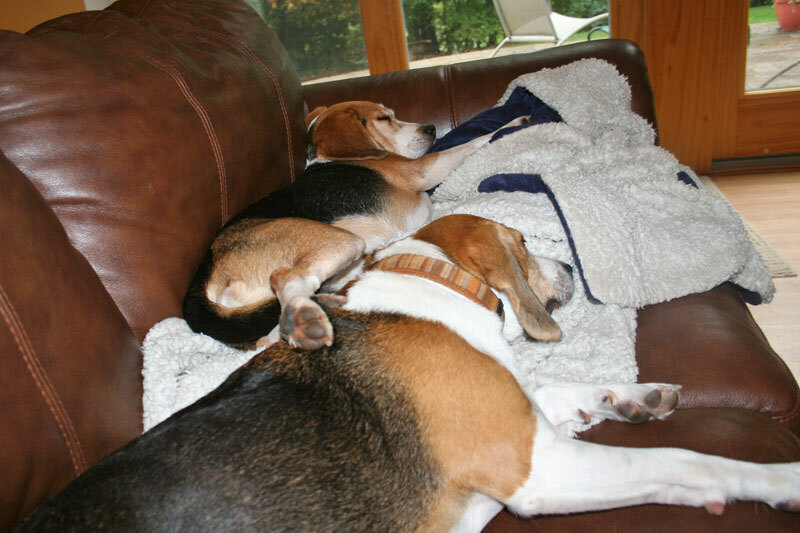 Buddy and Holly settled into camp almost immediately and appear to be having a great time. They especially like the doggy door. Who wouldn’t?! Sherman and Buddy are good friends. 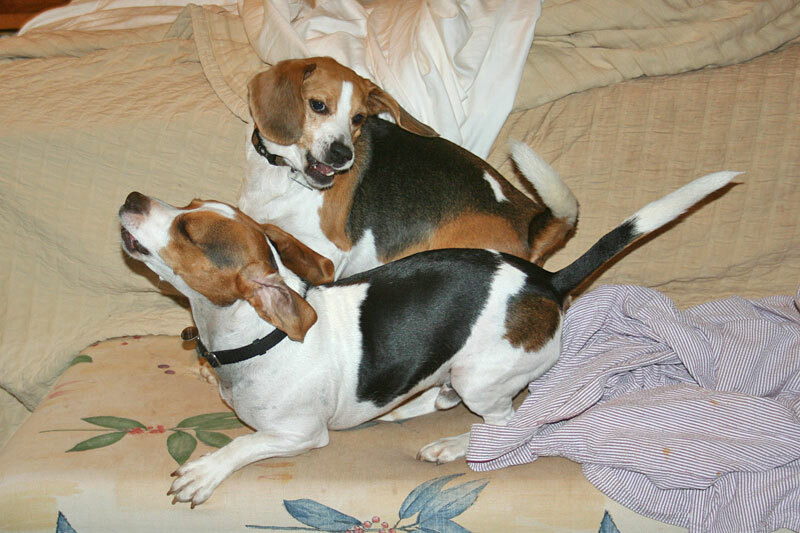 They like to wrestle and when they do, Stan and Holly provide color commentary. They are very sweet dogs and love to cuddle. On the third night we let them onto the bed and that’s where they sleep now. Phillip and I try to sleep there, too. 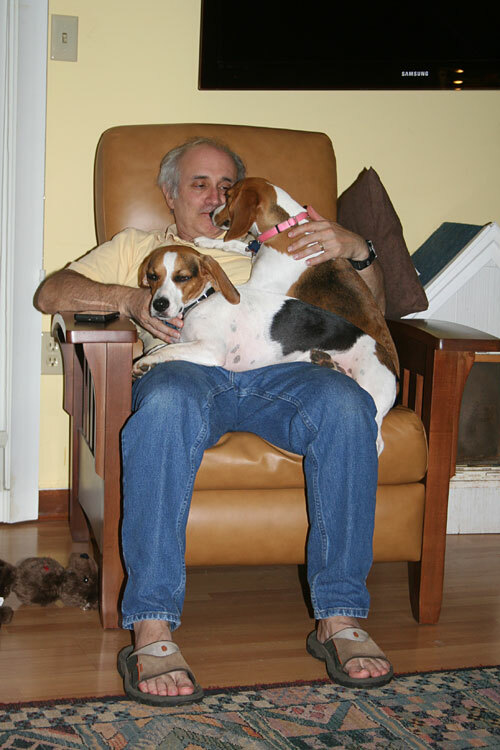 Uncle Bob is particularly fond of Buddy because he is part beagle and part dachschund. Not long after this shot Sherman decided that he would not share Uncle Bob with Buddy. 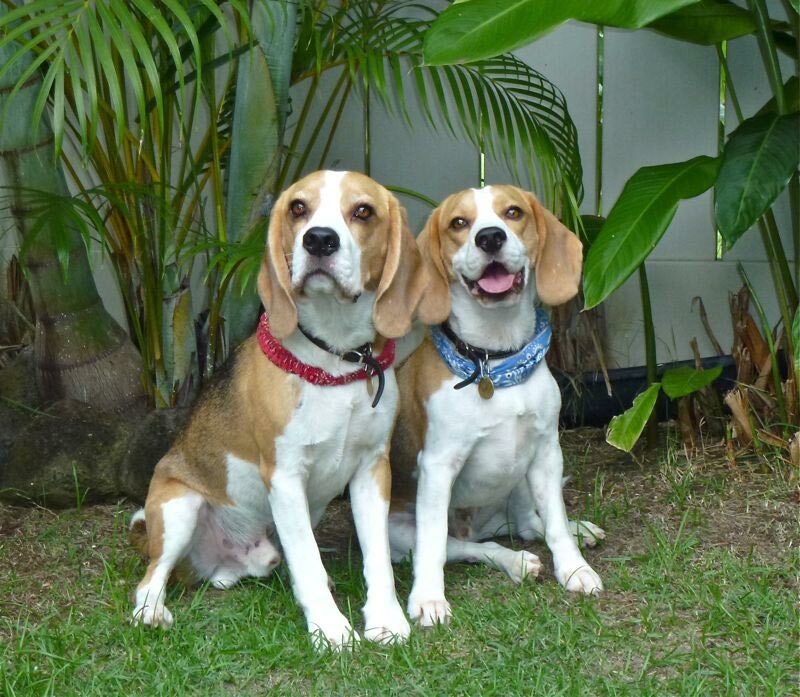 Audrey and Kevin: they’re happy and well-behaved and we love having them! Have fun and don’t worry about a thing! By the time you read this, Audrey’s Buddy and Holly will be checked into the early autumn session of Camp Kramer. They’ll be with us for a couple of weeks while their parents vacation in Barcelona. The camera is ready and you will see them here next week! “I managed to get this picture (and a slew of others) of Shotzy… laying on the bed in the guest bedroom with the sunshine streaming through the octagonal window… I felt rather artistic! I lost Baxter in May but you know they never really leave us. 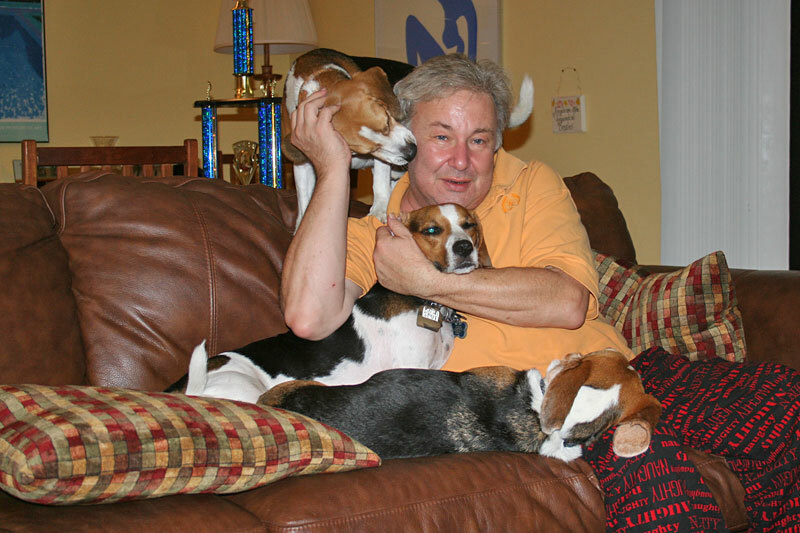 Baxter was such a gentle, loving dog – I remember my mother, who was afraid of all dogs before she met him, was also the first of us to let him sleep on her bed and completely got over her fear of dogs because of him. Baxter was the sweetest dog I’ve ever met and got me through more hard times than I thought possible. 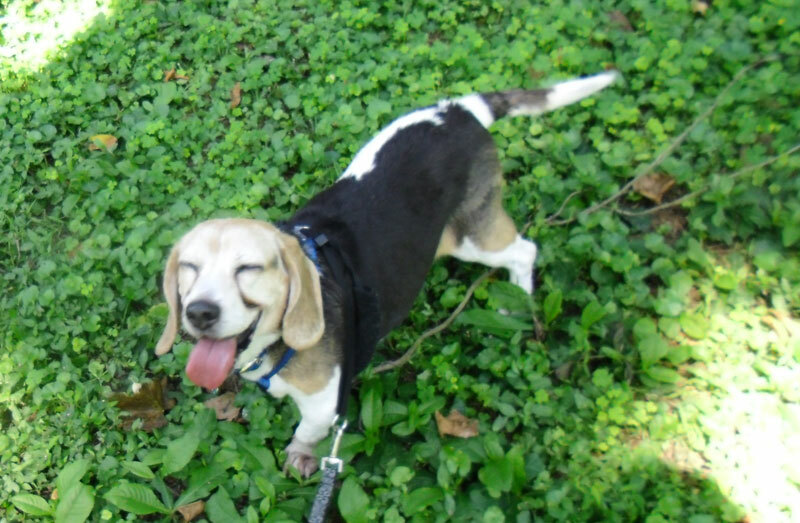 This picture shows him doing one of his favorite things, just going to the park and sniffing out anything he could eat and/or roll in, and finding strangers with treats who he could charm into sharing with him. Needless to say his big smile always made sure he was showered with attention. He was a happy-go-lucky guy who could always put a smile on my face, and I love him and miss him every day. Just look at that exquisite technique. 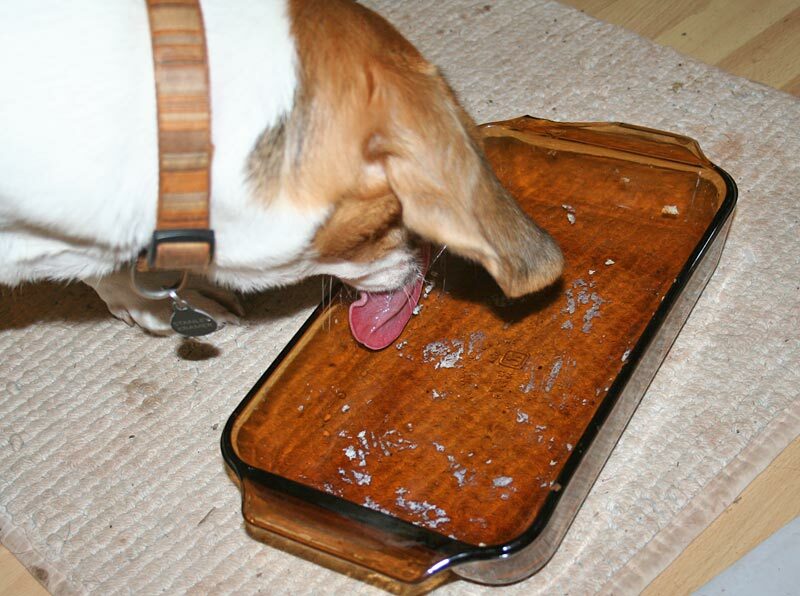 Corners are no obstacle for this dog’s tongue. I made a quick and yummy dinner last night – took thin chicken breasts and dipped them in egg, then coated them with a mixture of seasoned bread crumbs, parmesan cheese, and garlic powder. Added some mozzarella with about ten minutes to go in a 350 oven (30-35 minutes total). 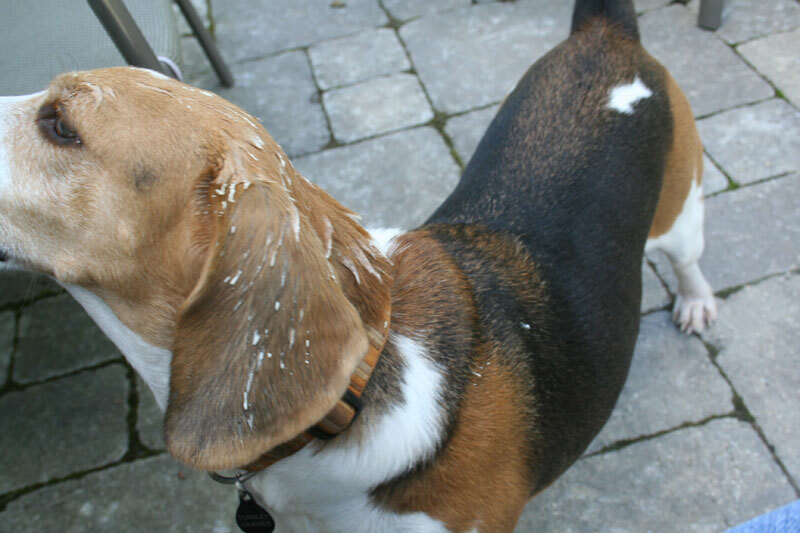 Stanley is usually the beneficiary of largesse such as this because Sherman leaves the kitchen following his after-dinner treat and can’t hear the the rest of the clean-up. Stan is incredibly diligent and I am lucky to have him in the kitchen. 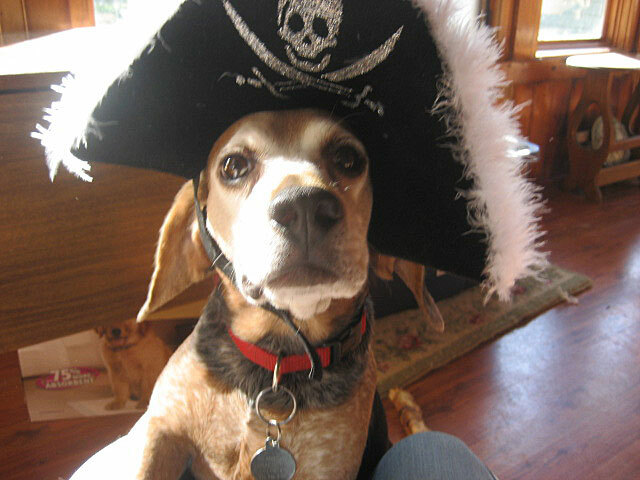 Last year I bought pirate hats (at PetSmart for half price two days before Halloween! ), hoping the boys would pose long enough for me to get some decent pictures. Cody, of course, had the hat off and was chewing the daylights out of it five seconds after I put it on him. Henry, however, was more cooperative. I got this shot of him as he was trying to crawl into my lap and attempting to understand what that thing was that I put on his head. I think he wore it another minute or two before he followed Cody’s example. 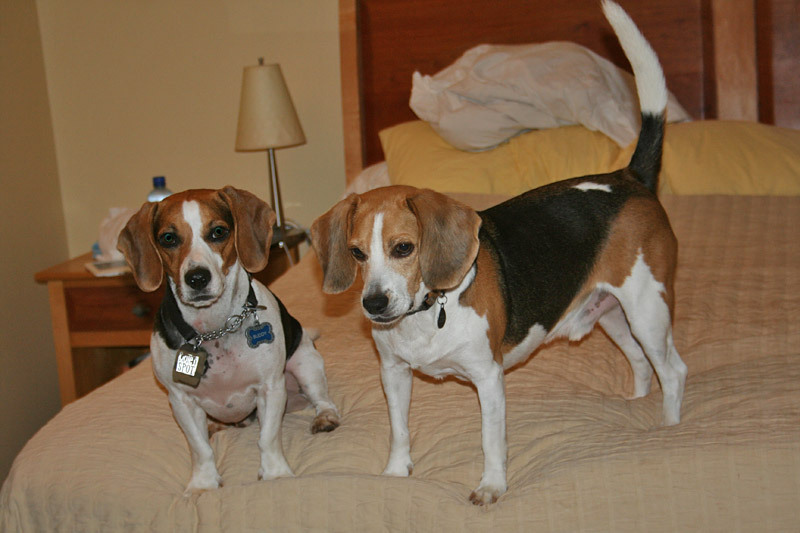 Our beagle, Ralphie, has a Mr. Fox, too. He was 11 on Sept. 11 and nothing makes me happier than to see him play. 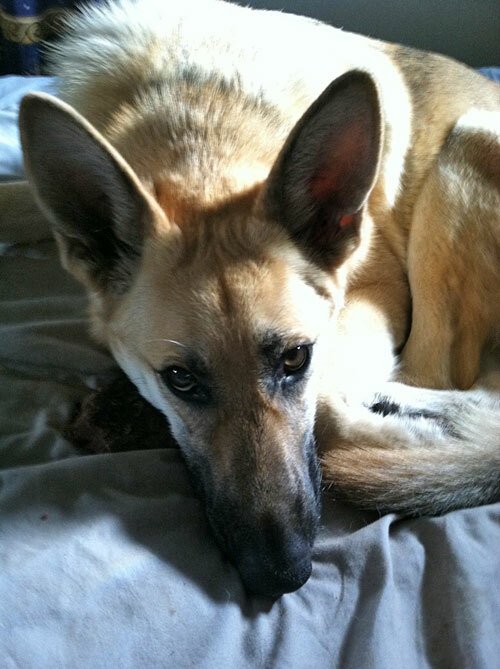 He and his German Shepherd sister, Roxi, have a few playing bursts a day. 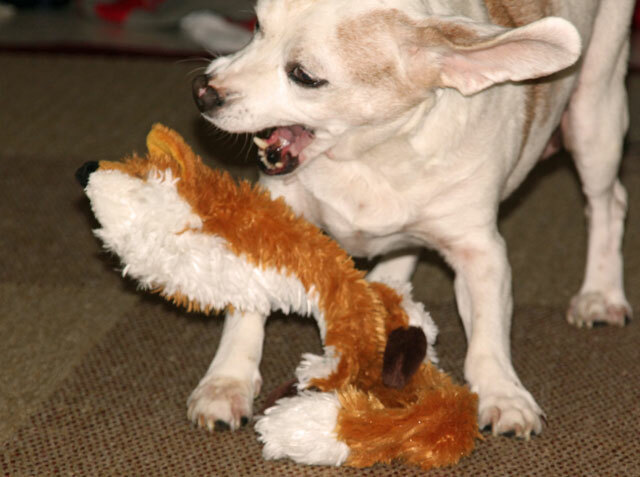 Just wanted to share a funny picture I caught of Ralphie with his Mr. Fox. There is also one of Ralphie’s human brother, Todd, trying to snag Mr. Fox. He didn’t get it, by the way. HAHA Ralphie loves to grab toys and run under the kitchen or dining room tables because Roxi can’t fit under them. Thank you for all of the smiles and awwww’s over the years. Our “downtown” consists of a tiny post office, where we pick up our mail, and a family-owned deli/convenience store. They specialize in Mediterranean food and on Saturday Phillip bought our lunch there: a chicken wrap for him and a tuna melt for me. The weather has been spectacular and we ate out on the Taj Ma Patio. The chicken wrap had some kind of yummy Mediterranean sauce on it, and since Phillip didn’t have a plate, he had to lean forward in his chair and let the sauce drip onto the patio rather than his lap. The boys were very diligent and cleaned up, but their heads were kind of in the way. It is more like me to rush inside and get Phillip a plate, but I had been lulled into a wonderful 75-degree-day-with-a-tuna-melt kind of mood and I found it much more fun to watch the boys get more and more Mediterranean sauce on their heads. 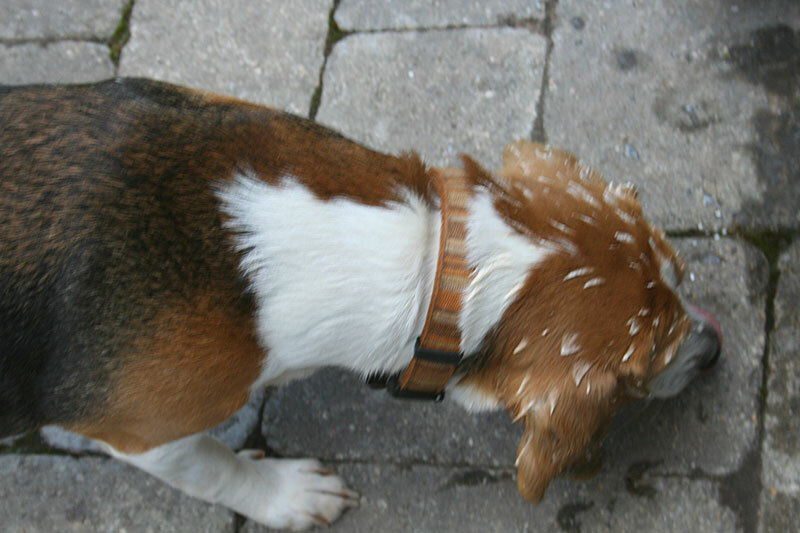 A brief shampoo ensued but just a little of that lovely aroma remains.